My coworkers Brigid and Aimee have worked together for years and are good friends. When they see each other, one will often say in a sultry voice, “Oh, hi” like she’s pretending to run into her high school crush by the locker, when in fact she planned the “accident” all morning. It’s alluring, theatrical, and goofy — over-the-top in the best way — and it cracks me up and warms my heart every time. This is how I feel about Maison Francis Kurkdjian Grand Soir. It’s a dense, sparkling amber-woody fragrance that is to perfume like chocolate volcano cake is to dessert, a marvel of too-muchness I find hard to resist. First, you’ll breathe in lush amber. Experienced perfumistas will know what I’m talking about right away. Those of you newer to perfume will recognize amber by its honeyed, ocean-infused viscosity that shimmers like topaz. In Grand Soir, it buzzes nearly as much as jasmine. Now, relax and let the fragrance’s materials bounce against each other and throw out notes that Kurkdjian might not have added. For me, saffron weaves through Grand Soir, giving it a fleshy, slightly medicinal feel sometimes. I smell cinnamon, too. Not enough to make me crave snickerdoodles, but enough to add structure. I wouldn’t be surprised if the barest breath of oud has found a home here. And, of course, chewy benzoin gives the fragrance a texture I feel I can squeeze in my fists. For all its intensity, Grand Soir commands only moderate sillage. I wouldn’t wear it at a conservative office, though. I’d save it for rainy afternoons when I have an appetite for comfort and a wink of self-referential drama. For me, its ideal home includes a November storm, a 1940s mystery novel, a thick quilt and a whiskey sour. Grand Soir lasts a solid ten hours on my skin, but by hour six, the grand soir has metamorphized to the matin à la patisserie. It’s a simple but comforting wood and vanilla. If you like amber and haven’t found that perfect amber to warm you on cold night or ease foul moods, I urge you to try Grand Soir. Other ambers you might enjoy include the delicious Parfum d’Empire Ambre Russe (amber, tobacco, and rum); the jasmine-infused, bouyant Aftelier Amber Tapestry; and the marvelously fetid Serge Lutens Ambre Sultan. Do you have any favorite “too much but so good” fragrances? How do you feel about amber? 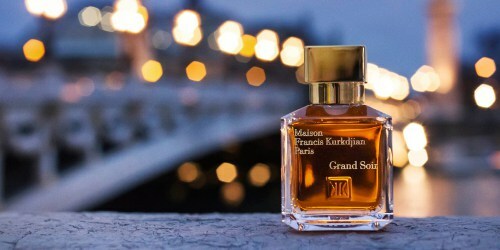 Maison Francis Kurkdjian Grand Soir Eau de Parfum is $215 for 70 ml. For information on where to buy it, see Maison Francis Kurkdjian under Perfume Houses. What a wonderful review Angela!- you’re idea of Grand Soir paired with ‘a whisky sour, a thick quilt and a 1940’s mystery novel’ sounds like heaven! , I think I’m going to have to make plans for the Grandparents to have the kids for a rainy November weekend so this dream can become reality.. Oh and Ambre Sultan and Ambre des Merveilles are my favourite ambers, Aramis Calligraphy Rose I found lovely when I tried it, similar to Ambre Sultan in some ways, I wish it came in a smaller bottle tho. I still haven’t tried Ambre Russe- I will have to remedy that, and compare it to Grand Soir when the weather cools down. All moms need an afternoon to themselves with a good novel from time to time! I haven’t tried Aramis Calligraphy Rose, and now I’m very curious. Thanks for the recommendation. It’s such a nice one, they share many notes, oregano and myrrh as well as amber, and a few others I think. Definitely a more is more, decadent choice!, and it can be had (under £50) cheaply too on eBay! This is a great review, and I love ambers so I’m definitely interested. After the winter we had last year I can hardly believe that anything would make me eager for November again, but your description of wearing it while cozied up with a whisky sour, book, and quilt have just about sold me! Oh my gosh, I completely forgot that Pink Sugar even existed! I haven’t smelled that one in eons! Where I live, we just ended a heat wave, and I was very glad to have finished testing Grand Soir by then. Too much but so good: that would be Cuir Mauresque, which I wear at home, at night, without company. Oh and Onda. Too much for me, so good on someone else: Salome and Absolu pour le Sour. I spent a year trying to find the perfect “straight” amber, thought I did, and then never wore it. Fortunately just a decant. I can’t be the only one — at the moment there’s a wandering samples package going round the German parfumo forum that contains !58! ambers. That someone else would be me – love all four of the ones you mentioned, and would add Back to Black as my “too much but good” scent. Sillage and longevity are over the top. Oh, I forgot about Back to Black. Great one. Thanks! I LLOOOVVVEEEE amber and recently received a sample of Grand Soir from my best friend. I am going to have to dig it out again from my sample sea and retry it. She also sent me an amber mixture which has something like 40+ essential oils in it and it is divine…I blend it with other essential oils and make my own fragrances and natural body products with it. I also love Eden Botanicals Amber Blend, Amber Pure and Simple, Fossilized Amber 5% and Labdanum 10%….all can be used as perfume oils or added to unscented lotions and carrier oils. For inexpensive amber fragrances I really enjoy Pacifica’s Spanish Amber and today am wearing Berdoues Grand Cru Cologne Collection Vanira Morrea which has a vanilla /amber/neroli/orange blossom vibe to my nose. I think of it as a great summer amber. It is versatile enough to wear year round…. Yet another one to try! Thanks! Pacifica Spanish Amber is a great candle, too, one of my favorites for winter. What a great idea to have your own amber motherlode to scent lotion. I love it that you compared Angel to a drag queen! It’s an apt comparison, since drag queens are so often deliciously too much. I suppose the closest Chanel comes to an amber is Coromandel, come to think of it. That said, amber doesn’t seem like much of a Chanel thing. But I’d love to smell one! I haven’t tried the Isabey, but I think I have a sample of the Tom Ford. I’ll go look for it! I found this one to be a generic by-the-numbers amber. Quite bland, though expected for MFK. It sounds like you’re not a fan of his work! Thanks for weighing in, though. Do you have some favorite ambers? Dense sticky ambers are not my thing so my one and only is L’Ambre des Merveilles, which retains many of the characteristics of classic ambers but lifts them into a semi-transparent veil. A marvel. But after this fabulous review I shall try Grand Soir. It’s always good to explore stuff you think you won’t like. You just never know! Oh, and for the afternoon at home under a quilt with a 1940s mystery novel – Rochas Femme. L’ambre des merveilles is much more sheer and light than Grand Soir, and is a wonderful amber, too! I have a strong stomach for an over-the-top fragrance, so Grand Soir is a good one for me. What a lovely review I have a marvelous little 5-ml decant that I use anytime I need an olfactory hug. It’s the only MFK that I adore. I adored the first spray of Grand Soir, dense but with a gorgeous lavender sparkle, like the glint of a diamante cuff. Sadly it flattens soon after to that basic vanilla drydown. On fabric it isn’t too much better, though I love those first 30 minutes. My favorite “too much but so good” frangrance is Black Orchid, like a strapless ballgown in purple sateen. You haven’t tried Absolue pour le Soir? I’d be happy to send you a sample. I’m sorry it didn’t wear better longer on you! Maybe my dry skin plays it out better. I’ve already tried pestering MFK’s PR firm for a sample, but they’re not biting on an older scent. I’ll be in Paris in August, though, so I’ll stop by the shop then and see if maybe they could spare a sample. But thank you so much for your offer! Is it okay if I get back in touch if I strike out in Paris? I’m a cologne girl year round, so my “too much” scent is Shalimar. I’m taking my time and making baby steps around her. Lucky me, there are so many Shalimar incarnations to explore. Grand Soir says “delicious” to my nose. Honeyed and chewy? Yes, please! I definitely smell the resinous side of amber, then there is an almost edible undercurrent. Something is faintly almondy and sweet, thankfully not veering into caramel which would take things too far. I adore the vanilla in the dry down which I can smell for hours the next day. And all that from a sample vial. I imagine spritzing from a full bottle would be wonderful. If you can manage Shalimar and Grand Soir, you should be able to stand up to any big gun out there! These days I more or less ignore “amber scents,” niche or otherwise. They are all rather similar and I’ve got more than a dozen. Moreover, I rarely wear them! At $215 for 70 ml (or even half that), there’s no way I’d consider buying a bottle. But my guess is that this is not being marketed to people like me. LOL. Amber is one of those categories that divides people, I think. On one hand, it seems so simply and accessible and, frankly, ubiquitous, that lots of people have simply had enough and take a pass. That might be you. On the other hand, some of us are simply pure gluttons. I completely understand the budget angle, though. I also liked this one! I have a sampler set and like half the box; this one, Petit Matin, Baccarat Rouge and A La Rose but the rest don’t work on my skin. My current favorite Too Much scents are Isabey Lys Noir (it’s a whole lot for summer), Tom Ford Noir Pour Femme, and the all time classic in-your-face beauty Fendi. We have had cooler than usual temps in Chicagoland so I have been able to wear these lately when they would normally be on hiatus until at least September. Another Isabel recommendation! And, oh, I know what you mean about Fendi. You’re lucky to have a bottle, though. I mean “Isabey” of course (danged autocorrect). Did you mention going to Paris somewhere or did I imagine it? Jovoy carries Isabey and if you sample Lys Noir, they have both the EDP (which I have) and Perle de Lys Noir (which I want!). The Perle just MORE – more intense, more sillage, and of course, more expensive. But worth smelling!! Yes, I am going, and yes I’d better stop by Jovoy for some sniffing. Thank you! I absolutely adore the opening of Petit Matin!! But it only lasts a few minutes on me. The remaining stages seem very “been there, done that.” Just last week I was lamenting over it’s fleeting opening, wishing I could bottle just that part. I haven’t tried Petit Matin, but I know Robin liked it. I know just what you mean, though, about wanting to bottle the top of some fragrances to smell them over and over! I have a few perfumes I feel that way about exactly. I recently sampled Corsica Furiosa, and it was like that for me- all top and no bottom, but gosh that top is good! I really like that one for the summer. So herbal and piney and fresh. Angela, thank you for the beautiful word pictures! For some reason Grand Soir reminds me of Fève Déliciuse. My sample of Fève is long gone so I can’t compare them side by side. I think Fève might be a bit sweeter. In reading other reviews, I’ve seen the same comparison–thank you for bringing it up. I haven’t compared them side by side, either. Ambers always smell so good at first but become boring after a while. That said, I enjoy Nobile 1942 Ambra Nobile occasionally in winter. I haven’t loved any MFKs so far, but I’ll give Grand Soir a sniff when I get the chance. Ambers are one of those categories that once you have one you like–assuming you’re an amber sort of person–there’s not a lot of reason to keep looking. They can feel simple, but sometimes simple is perfect. So agree with your review, Angela! Despite the fact that I’m not a fan of MFK as a brand I was mesmerized by Grand Soir and I bought a bottle to split. You smell great over there! This was already on my ‘to try’ list and now I’m essentially dying for it. I’m a big amber fan. As far as too much/all the better fragrances, Beloved Woman by Amouage is one for me. And then Alien Essence Absolu by Mugler, more due to it’s sillage and radiance than combination of notes. And in the same line as the Mugler, Roses Vanilla by Mancera. Positively nuclear. But also delicious vanilla roses, so I’m not complaining. Beloved Woman is one of my favorite comfort scents in a cuddly, womanly way. I don’t find it too much on me–but maybe that’s because I’m a fan! I haven’t tried Alien Essence Absolu, but the name alone tells me it’s a whopper. Angela, thank for a beautiful review as always! You are so great at visualizing scents! And “a wink of self-referential drama” will stick with me for a very long time. Haven’t tried this one yet, but other fragrances of this kind that come to my mind are Casmir by Chopard, Tsarina by OJ, Vanille tonka by Nicolai and Ambre narguile by Hermès. Casmir! Oh, yes, that’s over the top for sure. Ambre Narguile is another wonderful tobacco-amber scent.